“Lt. Dan” chronicles his transformation into real-life military advocate. Fifty years ago, President Lyndon Johnson was fired from his job. America — and its youth — was saturated with years of “progress” reports about Vietnam that turned out to be false. In a deep upsurge of anti-establishment rage, manifested in marches, moratoriums, and mass protests, Johnson was swept from the White House and returned to his Texas ranch. He was replaced by Richard Nixon, who punctuated his presidency with promises, promises of peace that were premature. Two years later, the theater was incorporated by its founding members, Sinise, Terry Kinney, and Jeff Perry, with a resident company that included John Malkovich, Laurie Metcalf, Moira Harris, and Alan Wilder. Later, Joan Allen, John Mahoney, Dennis Farina, and others joined. Careers were carefully crafted, and “Steppenwolf” — an artistic Armageddon — eventually achieved accolades, awards, and appreciative audiences all over the world. Sinise sometimes doubled as the artistic director; he was prolific and parsimonious in his productions, which had been limited to Chicago until he bucked the board’s objections, staged Sam Shepard’s “True West” in New York, and won an Obie for directing. Sinise succeeded logistically, but he was outmatched by Malkovich in performances, which were quickly praised by critics, celebrities, and customers. Soon, Malkovich was parceled and packaged by powerful agents, who managed media interviews and catapulted him to A-list movies and the covers of high-gloss magazines. Sinise, in contrast, remained underutilized — until he was picked to play Lt. Dan Taylor, “a disabled Vietnam veteran who loses his legs in combat,” in a movie called “Forrest Gump.” He was nominated for an Academy Award for that portrayal, which remains the role for which Sinise is known — and revered — throughout the world. Since 2004 — between gigs in “Apollo 13,” “Truman,” “Ransom,” “George Wallace,” “The Green Mile,” and “CSI: NY” — Sinise and his “Lt. Dan Band” have performed more than 400 concerts for half a million soldiers at military bases from Iraq, Afghanistan, and Kuwait to Japan, Korea, and Guantanamo Bay. 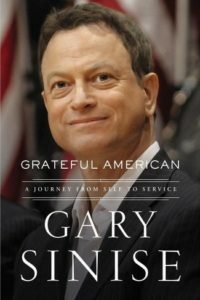 Seven years ago, he founded the Gary Sinise Foundation, which supports and strengthens programming at more than 30 serviceperson institutions. Sinise has been magnificently magnanimous to the sometimes taken-for-granted soldiers, an irony — especially during a time of prickly politics, demographic divisions, and willful warmongering. David Bruce Smith is also a grateful American, the author of 11 books, and founder of The Grateful American Foundation, which is celebrating its fifth year of restoring enthusiasm about American history for kids — and adults — through videos, podcasts, and interactive activities, and The Grateful American™ Book Prize for excellence in children’s historical fiction and nonfiction focused on the United States since the country’s founding.